In the business world, an 800-pound gorilla is that salesperson or company who totally dominates their market, taking more than their fair share of business, and winning time after time. In this book, you'll learn how many of the 800-pound gorillas of today are doing it, what skills and tactics they mastered to get to that level, and how you can incorporate their most effective techniques into your own sales system. Eight-hundred-pound gorillas don’t really exist in nature. The truth is, most mature gorillas don’t get much bigger than 450 pounds. But an 800-pound gorilla sure would get your attention if you saw one, and that’s the point. In the world of business, an 800-pound gorilla is the dominant player in its field that has such an influence on the marketplace that all other businesses must take notice when that company does anything. When you think about corporate giants, names like Microsoft, Wal-Mart and Google probably come to mind. These 800-pound gorillas go beyond offering you goods and services. They are touchstones for their industries. Their brands stand out because their marketers and salespeople have discovered the secrets of creating brands and companies that stand out among their peers. 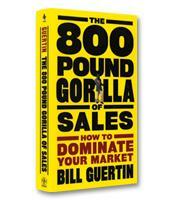 In The 800 Pound Gorilla of Sales, sales expert Bill Guertin identifies the sales tactics that help top companies dominate their industries. Throughout his book, Guertin explores a dozen vital principles that lead to competitive advantage. Highlighted with a variety of case studies that help to link salespeople to sales success, he also pulls examples from his own background as a salesperson and sales manager. 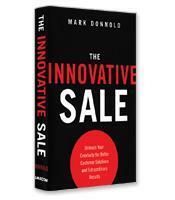 The result is a complete framework for improving sales techniques. Guertin explains that 800-pound gorillas are not the bullies one might imagine when visualizing a large beast of a competitor. On the contrary, these companies don’t simply rely on brute strength to win in the marketplace. Instead, he writes, they manage their risk better than their competition. They also make smart strategic moves and capitalize on relentless execution. And they usually work harder than others to create and maintain their dominant spots in their industries. Guertin writes that one of the things that sets an 800-pound gorilla apart from its competitors is its ability to take bigger risks than anyone else. He writes that a company must ask itself, “What am I willing to risk?” to become a top player. A variety of sports and business examples fill The 800 Pound Gorilla of Sales to describe how winning sales and marketing strategies are built. Since Guertin has consulted and trained the sales departments of dozens of NBA, NFL, NHL and MLB teams, he knows this territory well. When he is describing how a winning sports team has risen above its competitors, his personal experiences offer vivid illustrations of the sales strategies he recommends. One of the winning attributes that Guertin says all 800-pound gorillas have is authenticity. In other words, truth in sales and advertising is vital. Being genuine means being exactly what you say you are. He explains that knowing who you are — and honestly expressing and using your unique talents and qualities — is one of the keys to becoming a dominant player in your industry over the long haul. One way to remain authentic, he writes, is to continually study and learn. The more you know, the less you have to fake it. Sales prospects are acutely tuned into how genuine you are, he adds, so the more you can work from your own thoughts rather than a sales script, the more they will see and hear that your words are real. 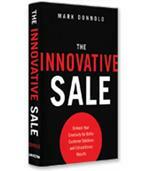 Guertin also tackles some of the most common objections to a sale in The 800 Pound Gorilla of Sales. He writes that the key to overcoming objections comes from anticipating reactions and preparing smart responses to them before the sales interaction. While his examples of objections come from an encounter between a sports ticket sales rep and a potential ticket buyer, his thoughtful preparation and answers provide salespeople in any industry with a clear look at smart forethought. 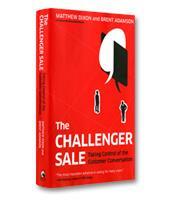 Finding common ground is one of the best ways for all salespeople to overcome objections, he adds. 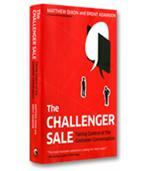 Taking readers through all of the preparations and interactions that are involved in most sales encounters, Guertin offers salespeople inspiring stories that can help them improve their selling techniques. He also offers them numerous ways to challenge the competition with strength and confidence.